Cripple Creek Stone Yard, located three miles north of Crescent, OK, offers an extensive inventory of beautiful rock. From New York state’s finest granite to building stone quarried in Hackett, Arkansas, Cripple Creek Stone Yard can locate the perfect material for your project. 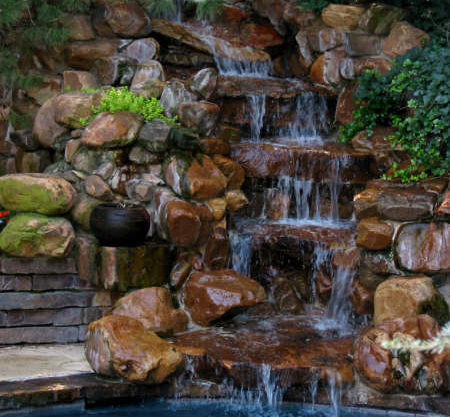 For the past twenty years, Cripple Creek owners Mike Foley and Marvin Schwartz have created state of the art waterfalls, outdoor cook centers, swimming pool coping, unique rock landscaping, fireplaces and fire pits, stone facades, benches, flagstone paths, and more. Click here to see a few of the projects these master craftsmen have completed in the Oklahoma City metro area. Cripple Creek is also authorized to sell the award-winning Kingfisher Kookers, flexible Convertible Mowers, Stucco Stone; a versatile and attractive cultured rock, and the exclusive Anamese decorative garden pots, imported from the Far East. Tour the Cripple Creek Stone Yard Web site and learn more about their products and services. Copyright © 2007-2008 Cripple Creek Stone Yard, Inc. All Rights Reserved.